Making extracts at home is fun, and saves quite a bit of money. While the cost depends on the supplies you use, most homemade extracts are less than half the price of their store-bought counterparts. Make extra to give as gifts! If you do, keep in mind that extracts take 5-6 weeks to fully develop, so you’ll want to get them ready before Thanksgiving to have them done by Christmas. It all starts with the vanilla bean, also known as the vanilla pod. Some grocery stores carry them, but if you can’t find them you can also get them on Amazon.com HERE. Investing in a quality pod, such as pods from Madagascar, will result in a higher-quality, better tasting extract. Vanilla pods aren’t cheap. Growing, harvesting and preparing them is the second most labor-intensive spice behind saffron. After the vanilla bean is harvested, it goes through a curing stage in which is time intensive, resulting in a richer flavor. So, be prepared to spend a little bit on these gems. Cut your beans lengthwise, exposing the vanilla seeds within the pod. You may need to cut again so they fit in your jar. Place inside the jar or bottle. Add enough vodka/bourbon to fill. Seal tightly and store in a cool, dry location. This process takes 5-6 weeks, so make sure you tilt your jars every few days to mix. 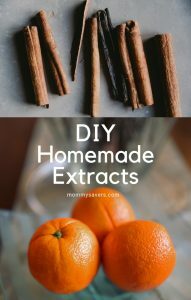 Since oranges and lemons are cheaper and more readily available than vanilla pods, these are great extracts to start with if you’re trying to save money. You may not be used to cooking with orange extract, but there are so many flavorful ideas to use your creation from cookies to pound cake to breads (more recipes with orange extract here). Zest your orange in thin strips. Insert the orange zest in your bottle, then fill with vodka. Seal tightly and store in a cool, dry location. This process takes 5-6 weeks, so make sure you tilt your jars every few days to blend. Make sure you remove the peels and strain before using. Zest your lemon in thin strips. Insert the lemon zest in your bottle, then fill with vodka. Seal tightly and store in a cool, dry location. This process takes 5-6 weeks, so make sure you tilt your jars every few days to blend. Make sure you remove the peels and strain before using. Zest your lime in thin strips. Insert the lime zest in your bottle, then fill with vodka. Seal tightly and store in a cool, dry location. This process takes 5-6 weeks, so make sure you tilt your jars every few days to blend. Make sure you remove the peels and strain before using. If you have mint in your garden, you know it grows like a weed. You’re probably used to using those mint leaves in drinks like mojitos (my favorite) and adding to salads like tabbouleh and Balela. But, all that excess mint can also be used to make a rich, flavorful extract you can use in hot chocolate, tea, smoothies, brownies and other baked goods. If you’re purchasing mint, use your nose as your guide to select your favorite variety. Spearmint, peppermint, chocolate mint will all result in slightly different variations. Gently wash your mint leaves and pat dry. Remove from stems if you haven’t already. Insert the leave in your bottle, using a chopstick to get them inside if necessary. You can use the chopstick to “muddle” the leaves slightly, to help them release their oils. Fill with vodka. Seal tightly and store in a cool, dry location. This process takes 5-6 weeks, so make sure you tilt your jars every few days to blend. Remove leaves and strain before using. I love this one! Almond extract can be used to make marzipan, biscotti, cakes and cookies. Blanch your raw almonds by boiling them for ONE MINUTE (don’t over-boil). Drain. The skins should look shriveled. Place them on a paper towel until dry and cool. Chop the almonds and place them in your jars. Fill with vodka. Seal tightly and store in a cool, dry location. This process takes 5-6 weeks, so make sure you tilt your jars every few days to blend. Remove almonds and strain before using.